Kolkata based start –up GIBL.IN totally overwhelmed its customers when it arrived at their door step with a complete office. March is a financial year-end and everyone has their own work to do, everyone is very busy. So it is quite hard to find the time to manage personal insurance renewal, tax filing and even buying insurance online. GIBL has come up with a unique solution. 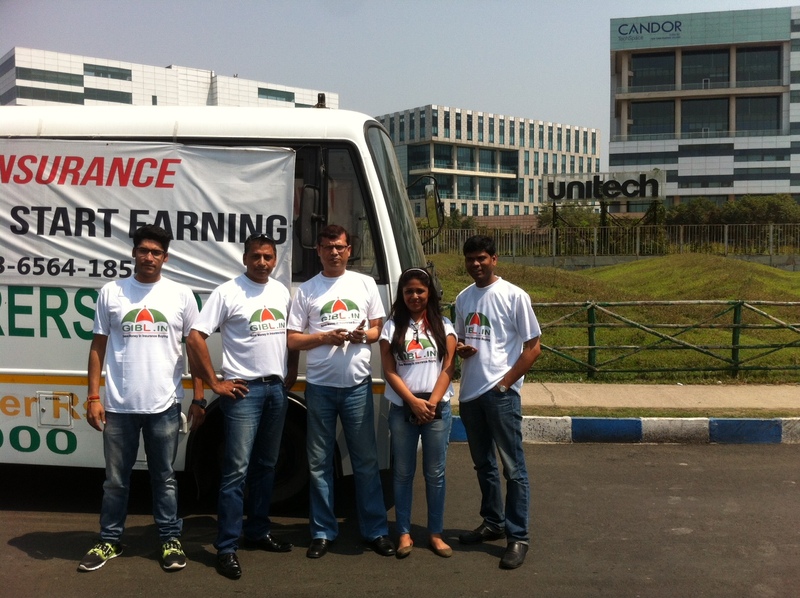 They have converted their office bus into a mobile office and they are taking a team of experts on the bus to all popular business parks in Kolkata, so that people don’t have to go anywhere else. They just need to come out of their office during their lunch time and go to the GIBL bus which is stationed in front of their office. Yes comparing & buying insurance online has been made that much easy. They can carry out all their necessary insurance related things – be it their health insurance renewalcar insurance or two wheeler insurance or general guidance or consultancy on Insurance. GIBL has developed the largest online insurance distribution through an easy Web & Mobile App based Market Place that provides the lowest insurance policy discovery & ensures effortless procurement. Anyone can compare & purchase any insurance policy in just a few mouse clicks. This market place is available on Google Play Store through an app called ‘GIBL Instant App’. Everything is available on ‘GIBL’s Office On The Go’ bus, together with their full team of experts. More importantly GIBL is actually implementing digital and cashless transactions to their fullest potential. People are coming and they are able to buy insurance online from just a mobile phone or from a tablet computer within a minute. In the state of demonetization this a fresh relief for the customers as they can do cash-less premium transactions through GIBL mobile app and get an instant online policy in their email account. To facilitate the whole environment GIBL has created a free Wi-fi Zone in the bus so people don’t even need to get into the bus to do the transaction. As long as they are within the Wi-fi zone range they will be issued the policy. GIBL uses tablet computers & smart phones to service the customers. Because of the financial year-end everyone wants to take the tax benefit and save up to 55,000 INR as per 80D by purchasing health or life insurance . 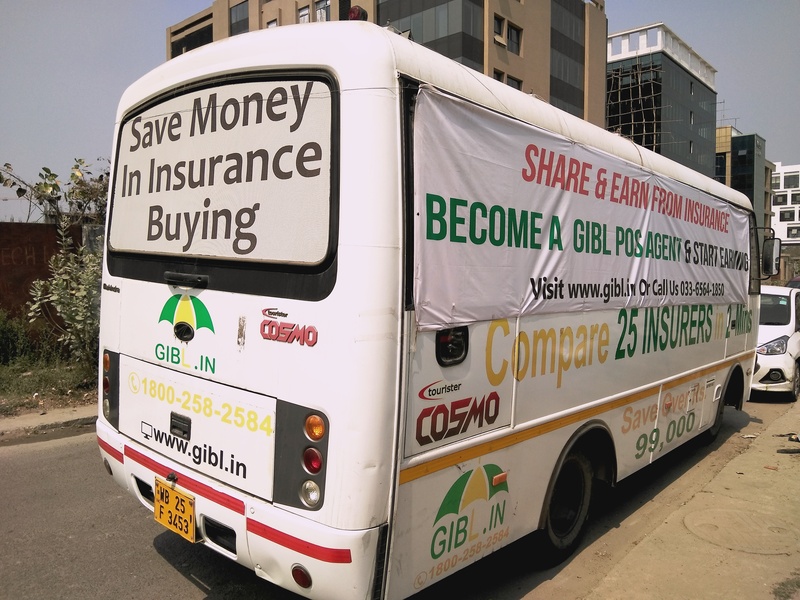 GIBL is saving people’s time by bringing the best consultancy and India’s lowest priced policies at their doorsteps. GIBL has contacted most of the companies in those business parks and made them aware when the GIBL team will be available at their office premises with their mobile office. This actually gives the employee the time to prepare their requirements and utilise the service to the fullest. This is creating a great interest and enthusiasm. People are particularly pleased about the referral app available through the GIBL Facebook page. This app gives anyone the ability to promote GIBL’s services and earn money by simply liking & sharing their Facebook page. In the last 4 days they have received more than 50,000 hits.